International trade has become increasingly important over the last several decades. 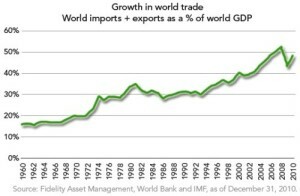 Trade as a percent of global GDP has steadily risen from 20% of global GDP in the early 1970’s to just 50% of global GDP today. One’s first reaction might be that service providers can stop reading now, because only goods – physical products, raw materials, etc. – are exported or imported. Not so. 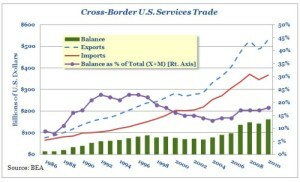 U.S. exports of services have escalated dramatically. The fascinating part of the story is that the increase in trade also involves services. Unless a business is looking overseas or across borders for both sourcing and selling, it may be missing out on opportunities for growth or cost reductions. Commercial construction – one of the seemingly most local of businesses – is even a candidate for international trade. I learned of this when an attorney at a Chinese firm approached me about introducing their client – a giant Chinese construction firm – to U.S. construction companies to joint venture on U.S. construction projects. As it turned out, the Chinese government had given cheap loans to their industry, and they were now using this as leverage to provide financing for commercial and municipal construction projects in the U.S.
One common misconception is that only larger companies import and export. One company I know makes high precision parts using highly specialized materials. Their secret sauce is their chemistry. They manufacture and ship one specialized product to one of the most famous luxury product manufacturers in Europe. 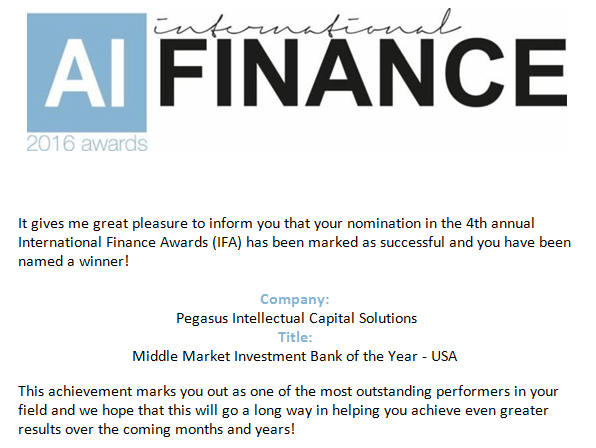 They do this and still obtain 20% EBITDA margins. They also source some of their supplies from inland China. How big are they? About $5 million in sales. This is all possible due to the Internet. The Internet also makes ecommerce possible. But many business owners believe that only consumer products are sold on-line. Yet one company I know has been very effective at selling industrial products on Amazon.com. I understand why. Finding industrial goods in small quantities or that are very specialized or infrequently purchased can be difficult and time consuming. Local suppliers are commonly set up to service only much larger orders. Google search, Amazon.com and EBay makes ecommerce possible. If you have a unique product that is high-value relative to shipping costs, the world is your oyster. Ecommerce eliminates borders, and eliminates your geographic limitations, subject only to shipping costs. As a hobbyist, I needed a very specific diameter of pipe with a very specific wall thickness. I found exactly what I needed, in aluminum, on Amazon for about $57. It probably cost the manufacturer a few dollars. I could care less, because it saved me so much time looking fruitlessly locally.